Black Eyed Susans often get cited as dye plant sources of green. I thought the name referred to those little annual climbing vines with orange flowers. Delighted to find out that the dye plant was really Rudbeckia, I love yellow daisies and already had a couple of patio pots full of Goldsturm. In 2013, I split up the rootbound clumps and replanted them along the path of my new Dye Garden. There were only a few flowers last summer, but this April, when I came to plant out the annuals, the Rudbeckia leaves were coming up thick and fast. By July, a rich river of yellow daises had grown, a bit taller than is ideal for having right by the path. A few fallen plants could be considered self selected dye materials. I had noticed some people on the Ravelry forum 'Plants to Dye For' got olive green colours on wool, while others' results were beige. Time for a careful read of Jenny Dean's book 'Wild Colours' so as to achieve that green. To get the colours out of Rudbeckia, the book says the plants need a couple of hours at a proper boil, several days to steep, then another boil before sieving the bits out of the dye bath. I mordanted some white fleece and a piece of silk with 10% alum and added two tiny skeins of wool, one mordanted with iron, the other with copper. The ratio of fresh plant weight to dry wool and silk was over two to one. I prefer to think of the outcome as 'cafe au lait'. Maybe Goldsturm was the wrong variety. Back to the books. Rita Buchanan clearly specifies Rudbeckia hirta Goldsturm in 'A Dyer's Garden' and makes two encouraging points -the flowers give more green than the whole plant and a high ratio of plant to fibre works better. Sixty flowers weighing 200g went into Dye Bath Mark 2. Through the whole boil, steep, boil process, this must surely turn 50g alum mordanted wool green? Beige. That yarn is three ply, took me ages to comb and spin consistently, twist matching the crimp, just like it says in The Spinners' Book of Fleece. One of the little test skeins from the first dye bath was a bit more interesting, only I forgot to put knots in them to remind me which was mordanted with what. Back into the dye bath with 40ml from the jar of copper piping steeped in vinegar water. No change after half an hour on the heat. Another splosh from the rusty nail jar to add iron and tadah! The photo on the right shows olive green/khaki wool, only you have to take my word for it because the camera hasn't picked the colour up properly. Here is Elinor, wearing Thelma the sheep's Down type fleece spun and dyed with Black Eyed Susan plus copper and iron. The hat pattern is called Cinioch by Lucy Hague. Knitting her celtic cable designs requires concentration, but I'd say the results are well worth the effort. The hat was a bit big on completing the knitting, but looks quite modern worn slouchy. I name it Thelmioch. It shrunk to the proper size after washing and blocking. "Now your daughter has such a career in knitwear modelling, it hardly seems worth her going off to University." "Wow, where did you get that hat?" "Just a little something Jean Paul put together for me. I do prefer a more classically contemporary style." A hot July by local standards has suited the Japanese Indigo plants growing in the garden. So many seedlings came up in trays this spring, spares went out in the earth in April, rather than hit the compost heap. Too cold, those were terminally stunted or just disappeared. I have already had one harvest from the six that stayed in the greenhouse and the potted ones that were planted out in May are now going great guns. Even the plant in a shady border developed blue marks after I crushed a leaf. Taking the secateurs round the half dozen outdoor survivors provided another 450g of leaves and stems to dye with. Time to try again at getting the indigo out with an extraction vat. The instructions on the Wild Colours website are not complicated. After failing with this process last year, I was scrupulous in following them to the letter. The leaves in the bowl were steeped in hot tap water, with hot water in the sink renewed three times over 24 hours, the whole thing being covered to retain warmth. Blue showed at the edge of the washing up bowl and the leaves had leaked out a promising deep brown bath. Several sources say that Japanese Indigo has twice as much pigment in it per weight of leaves compared to woad. The vat doesn't smell the same, pleasantly vernal rather than boiled cabbage. After extraction, the process is much the same for the two plants. I carried on with the soda ash and the aeration then the Spectralite, hurriedly putting a bit more fleece in for a soak, now expecting plenty of blue out of this vat. What with the Tour de Fleece spinning, I had no Polwarth yarn prepared, but I did have about 50g scoured fleece which got the first and second dip. This did take up a much deeper blue than I've had from vinegar extraction. Now I've spun it up, you can compare this wool to the two vinegar method skeins. I do winge about this, ought to go and talk to someone who knows about photography, but my camera is not great at picking up shades of green. While pale, the vinegar method skeins have a subtle green cast to their blue which is hard to describe. The deeper blue is pretty much as shown here. A simpler colour, very close to what I have had from woad. At the end of the session, I put in a last bit of fleece to take up whatever dye was left. The remnant of the bath, shown below, gave a more turquoise shade. Considering the three balls, I am not that impressed with them as a colour sequence. They don't go together in the way I had hoped. A further disappointment of this vat was how little colour was taken up by my silk jersey fabric and cotton scrim. They looked quite exotic while damp, but I wouldn't bother putting up a picture of the result when they had dried. Drab is the word that comes to mind. I would have expected 450g woad leaves to give a good mid blue to at least 150g of materials. Japanese Indigo is supposed to be stronger and I had believed the extraction vat would dye silk and cotton better than the vinegar method did. Most likely, I did things wrong at some point, but I can't for the life of me work out what. So far, vinegar extraction and dyeing on wool has proved quicker, easier, cheaper and considerably more rewarding in terms of colour interest, if not depth. "Someone's lost a shilling and found a sixpence." Elinor Gotland, astute as ever and twice as annoying. "Oh, I was hoping to make something using a sequence of Japanese Indigo dye colours to represent Act Two of the opera, Madame Butterfly. When she's waiting for Pinkerton's return." "What, all naive pining and ill founded expectations?" "I mean constancy despite isolation, depth of spirit in adversity, enduring faith in love. Should have thought you would relish that operatic passion." "Not my bag, Beaut. Gazing out to sea from the cliff top never buttered any girl's parsnips." "What would you have done, if you were Cio-Cio-san? Smiled at another sailor?" "Think I'd have spotted that everyone in my life so far was just out for what they could get. Cio-Cio could have made a success of the geisha business, retired on the proceeds and done something interesting, like study haiku." "Indeed. Now get a grip and stop contemplating ritual seppuku over a bit of blue wool. Time to steep some cheerful leaves. A nice tea ceremony will soon put you right." "Where's Bradley Wiggins, then?" Elinor Gotland was most disappointed to find that he had not been selected to ride in the Tour de France 2014. 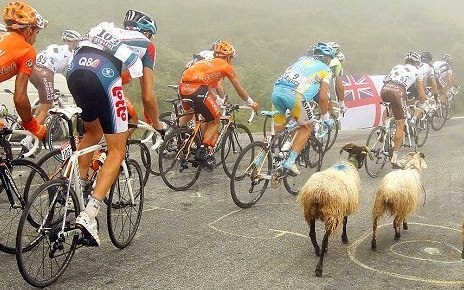 "I didn't know sheep followed the cycling, Elinor." "Some do. Not me. Scrawny bunch, that peloton. Lycra is very unforgiving. " I was busy spinning my challenge for this year's Tour de Fleece, not paying much attention to Elinor or who got to wear the maillot jaune, truth be told. "It's his style I admire. Team Sky have been fools to themselves. Win or lose, Sir Bradley is worth watching in any colour jersey." Elinor pottered over. "What's that brown fleece you've got there?" "It's half Gotland, half Black Welsh Mountain." The photo shows a lock of Gotland and a lock of Black Welsh Mountain fleece on either side of the crossbreed locks I was spinning. Neither parent had soft, fine fibres, but the combination gave a medium crimp, deep colour and good lustre. At Wonderwool last April, I bought 1.2kg raw locks, intending to spin it up to knit my son a hardwearing jumper. No cutting corners, the whole lot had a proper wash in buckets of hot water with Fairy Liquid to get all the dirt and grease out. The fibres were 5 - 10cm long, easy to card into rolags and free flowing. The challenge I had set myself for the Ravelry Tour de Fleece 2014 was to learn longdraw spinning to create a really light, warm, woolen yarn. As I understand it, the prime difference from worsted spinning lies in the drafting. Mostly, I have used short forward draw, drafting fibre out of a rolag with my left hand before letting the twist from the wheel run into it. For longdraw, the twist is allowed to pull fibres directly out of the rolag while you move your right hand backwards, letting wool flow out. What tended to happen to me was that the twist pulled more, then less fibre out, giving a very uneven thickness to my singles. On the videos, people seem to stretch out the length of yarn smoothly from the rolag, but mine kept breaking so I just tweaked the thicker sections with my left hand to even it up. Here are ten rolags, which I spun to make each single, as shown on the bobbin. Plying two together made a yarn about double knitting weight, shown on the niddy noddy. It was interesting to see what everybody else in the team was up to, posting photos on Ravelry and enjoying encouragement and advice as well as admiring some lovely stuff. Even so, I felt a very dull dog, showing yet another skein of brown wool. I cursed my lack of foresight in choosing a fleece that really did not need dyeing, just at the time when so many fresh dye plants are begging to be used. Despite all this, plus some bad days when I just couldn't get the knack of longdraw going, I did like this fleece. Crisp, but manageable, I would consider it a good choice for trying a new technique. The skeins have kept a nice lustre, even after washing, snapping to set the twist and slapping on the kitchen counter to full them out. By the end of the Tour, I had 15 skeins and by my calculations, around 1000m of longdraw yarn, which is 2km of singles. I knitted up a swatch and put it through the washing machine on a wool cycle. It came up much softer though somewhat less shiny. Gotland X Black Welsh Mountain was never going to make a fabric for wearing next to your skin. Just to see how it would come out, I blended some Gotland with Black Welsh Mountain shearling locks and spun it up the same way. In the sun, Elinor Gotland's worsted arse has a glossy halo. Spun longdraw, the Gotland fibres were even fuzzier than when I spun them with a short forward draw. Resistant though my firstborn is to any notion of pattern, I might sneak in this skein of combination fleece blend to jazz up his brown crossbreed jumper.